The BlackBerry 9000 "Bold" smartphone's support for tri-band HSDPA and enterprise-grade Wi-Fi networks and its next-generation 624MHz mobile processor make short work of downloading email attachments, streaming video or rendering web pages. Display: High resolution 480 x 320 pixels LCD screen with light sensing technology. 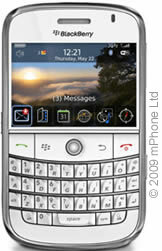 Buy Blackberry Bold 9000 SIM Free for use with any GSM or 3G SIM card / line including all those on UK networks like O2, Vodafone, Orange, T-Mobile, Three and Virgin (pre-pay and contract).